Cool Home Accessories with Unique Style – Too Easy! Cool Home Accessories with Unique Style - Too Easy! I love home accessories! You know, home decorating bits that really catch your eye - things you have to have before anyone else - from a gorgeous blanket, the latest kitchen knife or tea cosy or something from an unknown artist like a sterling silver spoon or ceramic teapot from amazing stores like Papa Stour. Unique Style - High Quality - You bet! 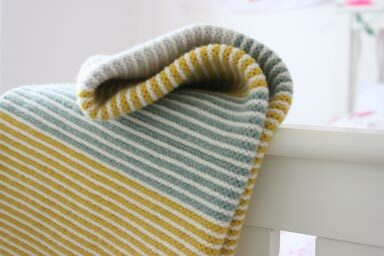 Here's a great example - this small striped blanket by Nicola knitted in the finest 100% lambswool. 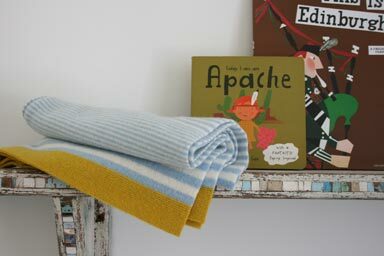 The blanket is super lightweight - available in different colors and 60cm x 92cm. These unique blankets are great for home decorating or gifts. Always on the hunt for unique style I was impressed with the great home accessories at Papa Stour like this playful ceramic teapot from young Designer Kevin. 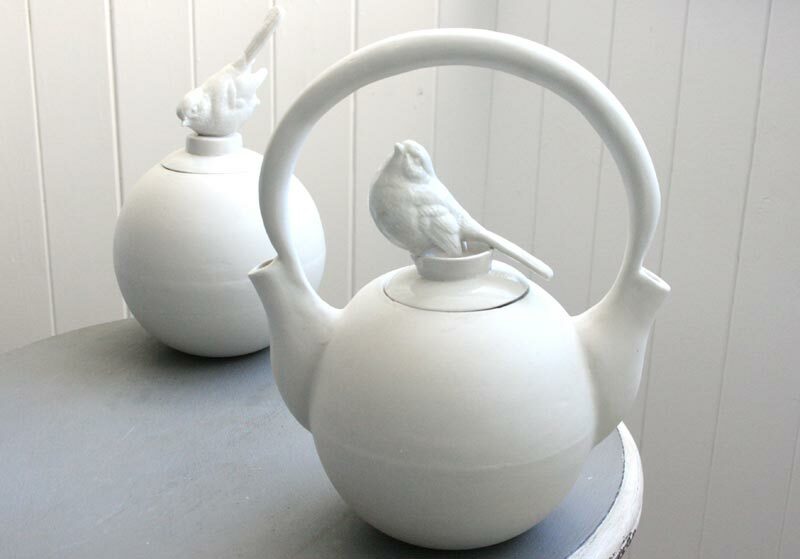 The ceramic teapot is batch produced using slip cast stoneware. It is food safe and stands 30cm High 26 cm Diameter. Unlike other online sites, Papa Stour's Rosie Brown looks only for high quality, unique pieces that help new designers get known. The Scottish Online Store carries a great range of handmade gifts and accessories from Scotland's best designers and artists. Rosie Brown hand picks each collection, scrutinizing for quality, originality and design. From a quirky hand-made tea cosy or blanket to sterling silver spoons - there is always something unusual to pour over - great gifts too. 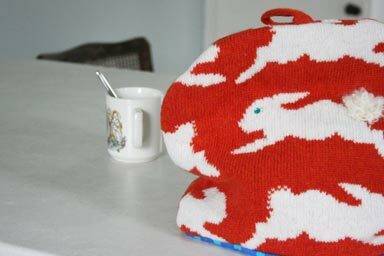 Like this witty tea cosy by Jenny is knitted with Scottish lambswool with a colored knitted loop on top. The exterior of the tea cosy is knitted lambswool. The tea cosy interior is contrasting brightly colored, pattered cotton fabric. A layer of wadding between the knit and lining keeps in the heat. You can see other tea cosy designs here. Papa Stour is the result is small batches of well-crafted, made-to-order, handmade products by Scotland's brightest artistic talent. In a time of mass production, Papa Stour is a wonderful way to access unique designs and gifts. Look at this sterling silver spoon by Barney. The wooden handle is made from old whiskey cask oak staves. 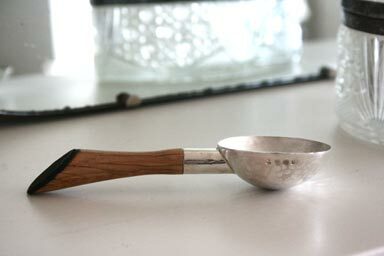 The bowl of the silver spoon is 45mm diameter, the short-handled spoon is 120mm long and the long-handled is 170mm long. This gorgeous silver spoon is short enough to be stored in tea or coffee containers, a great christening gift. Let's face it, great home accessories are an easy home decorating fix, a way to layer decorating with things that capture your own sense of unique style and personal loves to change the look of your home. Easier than making something, easier than painting a wall or installing a new bathroom. From a great chandelier to a must have sterling silver spoon. Founded in 2005 by stylist and designer Rosie Brown, in 2010 it became a collaboration with Rosie's sister Sally. Rosie Brown styled for the best including Elle Deco, Living Etc, Home & Gardens, Monkwell, Dulux and Swarovski and The White Company always retaining her unique style. I think of home accessories like jewelry for your home. Each room might have a different home decorating style or theme and each one needs its own set of unique accessories to use or give it personality. So if you're looking for home gifts for yourself or others with their own unique style head over to Papa Stour and see what Rosie Brown has found for you. Whether it's a blanket, ceramic teapot or something else to add to your home decorating - one thing is for sure, it will be great quality and no-one else will have it.. too cool! If you like this article - love to hear from you or get a Facebook Like.. Till next time.